Robert Langdon, literature’s most famous symbologist, is called in to solve a bizarre murder at the beginning of The Da Vinci Code. The murder sets the plot in motion, driving the hero into a race to solve the puzzle before the villains. Certainly, The Da Vinci Code must be a plot-driven novel. BUT Robert Langdon uses his specialized knowledge to advance to the next step in solving the puzzle, so The Da Vinci Code must be a character-driven novel. Writers have been arguing the advantages and disadvantages of plot-driven versus character-driven novels since the birth of genre fiction. At a recent workshop, best-selling thriller writer, William Bernhardt, had a different take. Plot and character must be interwoven for a story to be successful. The character is chosen for the plot. The plot is chosen for the character. Every scene should have something happening that changes the protagonist’s life. That change, in turn, affects the next plot twist. The character is revealed by how she reacts under pressure. The greater the pressure, the deeper the revelation. So don’t try to define your novel as plot-driven or character-driven. To be successful, it has to be both. Here’s proof that thriller writers have more fun. In his workshop on using non-fiction techniques in fiction, bestselling thriller author, Douglas Preston, pointed out that successful thrillers like Coma, The Firm and Raise the Titanic are, at their core, non-fiction. So how do you integrate your passions about the real world into your fictional world? First, write down three areas of your specialized knowledge. I chose Travel Writing, History and Public Relations for the federal government. You might think that last one is boring, but consider where Dan Brown’s latest blockbuster, The Lost Symbol, is set. Go on another African safari, this time with my family. Go on an Alaskan wilderness trip. Stay at one of those huts perched over the beautiful waters off Bali. Raft the Colorado River through the Grand Canyon with my family. The goal of these exercises is two-fold. You not only should integrate your life into your fiction, but integrate your fiction into your life. For instance, if your novel involves a car chase, go to a hands-on lesson on race car driving. You’ll not only have a blast, but will use that reality to make your fiction more believable. In my case, I used my interest in history and my goal to see the Taj Mahal by integrating the fascinating story behind the Kohinoor Diamond into The Seventh Stone. Preston told us his readers thank him for teaching them about an aspect of the real world through his entertaining stories. As a reader, I always enjoy learning through fiction, whether it’s historical, an insight into another culture or a scientific concept. So go ahead and pursue your passions in your real life so your fiction can be more “real.” Your readers will thank you. Click cover to buy it now. NEW HIGH STAKES THRILLER FROM BEST-SELLING AUTHOR ASKS READERS, WHAT DO YOU DREAM? Trapped between a man who vows to save her future and a lover from her past, Princeton historian Christa Devlin is thrust into a heart-pounding quest for one of the world’s most dangerous and powerful artifacts. . . the Emerald Tablet. Last seen in the hands of Alexander the Great, the Emerald Tablet can open the portal between life and afterlife, between man and spirit and, Christa hopes, between her and the traumatized mind of her beloved father. Her ruthless adversary will stop at nothing to find the Tablet first and weaponize its power using the mind-controlling nanobot technology at the island’s prototype Dream Resort. Christa races through the jungle-choked island where the imagined becomes real, prehistoric animals morph into nightmarish beasts and love can twist into evil. She must find the Emerald Tablet and solve its ancient puzzle before the world spirals into a catastrophic future and she loses her father forever. FROM THE AUTHOR: What if technology could tap into your inner thoughts and make the imagined become real? Some might develop this as the ultimate amusement ride or, taking it deeper, realize that it’s a portal to our inner soul, a way to strip away physical limitations and discover what truly makes us human. But this concept is as old as humanity. I knew little about the Emerald Tablet before writing this book. The more I learned, the more it emboldened me to weave its history into an action-packed adventure that, I hope, inspires as well as entertains. It’s a thrill ride through history, from Merlin and dragons, to the Greek Minotaur, to a mysterious vanished Mesoamerican civilization, looped together by the Emerald Tablet. Thank you to all my readers and friends for your support! If you choose to buy it, I hope you enjoy it. If you enjoy it, I hope you review it on Amazon. High Stakes Often, the future of the world is held in the balance, whether it’s an evil conspiracy to control financial markets, a bio-weapon unleashed in the water supply, or a powerful artifact that will alter the destiny of humankind. I wove all three into my first thriller, The Seventh Stone. Seemingly Impossible Odds As in some of my favorites: Indiana Jones and his professor dad against the Nazi juggernaut; Douglas Preston and Lincoln Child’s Agent Pendergast against his clever but deranged brother; a teenage girl who must fight to the death to survive gladiatorial-style games in the Hunger Games. Universal Theme The search for truth about the fundamentals of the Christian faith, the utter determination of an innocent hobbit to right a wrong, underscoring the value of human life by risking, sometimes sacrificing, your own. The Ticking Clock, the Moral Struggle, the Larger-than-life Characters and more are all ingredients for a successful thriller covered in the many writing books, conference workshops and how-to articles on thriller writing. But, surprisingly, one key element barely merits a mention. It is the driving force not only of a compelling story, but what makes authors want to write that story and readers eager to turn the page. It motivates fiction and real life. It steers our choices and the story’s characters’ choices of what to eat, wear and say. It’s why we do what we do at work and in play. The Desire to be Loved. Romance is the most obvious use of this core element. Readers flock to the Mockingjay trilogy for the dynamic between Katniss and Peeta. Indiana Jones begins and ends the search for the Ark with Marion. And James Bond (well, need I say more?). But the desire to be loved can motivate the hero’s search for truth about faith to confirm the love of God or the villain’s need to control the world to gain his twisted father’s approval. Even when it is beneath the surface of the story, buried like the troubled past of Teddy Daniels in Shutter Island, the desire to be loved is why the reader connects to the characters and keeps reading. What books have you enjoyed where you kept turning the pages not only to see what happens, but to find out if the character fulfills this fundamental desire to be loved? I was recently in western Massachusetts and visited two distinct “literary” sites. One was old, Edith Wharton’s fabulous house, The Mount, built at the turn of the century. It offered a fascinating look into the life and times of this remarkable woman. The other site was new, founded in 1980. It is the Yiddish Book Center, a growing collection of more than 1,000,000 (yes, one million) books published in Yiddish. These two sites had more in common than location. I’ll be the first to confess that the idea of visiting a collection of Yiddish books wouldn’t be my first choice for a fun way to spend an afternoon. The only thing I knew about Yiddish was that a lot of Jews used to speak it. Right? Even most Jewish leaders considered Yiddish “dead.” But the front desk man at Amherst’s venerable Lord Jeffrey Inn insisted The Yiddish Book Center was worth the trip. And it was. It all started with one young graduate student named Aaron Lansky who realized that Yiddish was fading away as surely as the older generation who spoke it. These elders had cherished their books, many bringing them with them from the old country, saving the books over other items. But their children and grandchildren didn’t know what to do with the books that they couldn’t read. Books were being destroyed, no longer wanted. Lansky put up flyers asking for Yiddish books. The response was overwhelming. Lansky received not only donations but letters from elderly Jews asking him to come get their books. He’d not only get their books, they’d tell him their stories. Lansky found himself not just saving print books, but rescuing a world that was vanishing. They weren’t just handing him their books; they were handing him an inheritance. These Yiddish books do more than just sit on shelves. The books have inspired a worldwide enthusiasm for renewing the Yiddish language. Now it is the younger generation that is learning the “dead” language. And people like me are learning about the Yiddish culture. Who would have guessed that print books could lead to this? Edith Wharton’s estate, The Mount, of course, has an intimate bond with the literary world. Wharton wrote forty books in forty years. She was the first woman to win the Pulitzer. She designed The Mount. When visiting it, you feel you’ve become her guest, and can envision her enjoying the gardens she designed. But the room that offers the most insight into Edith Wharton and the tangible value of print books is her library. When Wharton’s marriage fell apart, she left the Mount, taking her beloved collection of books with her across the Atlantic. After her death in 1937, the collection was split. Some were destroyed in London in World War II. Eventually, one man dedicated himself to taking on the guardianship of Wharton’s remaining books. To make a long story short, (find out more here) the collection was sold back to The Mount in 2005, and now once again fill Wharton’s bookshelves. One man saved them all those years. The books not only show the breadth of her interests and passions, but the unique personal connection to history. One book is signed by Theodore Roosevelt. Others by Henry James. As a child, Wharton was drawn to books, taking them off the shelves, holding them before she was old enough to read. Having books at hand influenced not only her life, but those of her future readers. Don’t get me wrong. Ebooks are a boon to both writers and readers. My thriller novel would still be waiting for publication, not on best seller lists both in the U.S. and abroad, if not for the invention and popularity of E-readers and indie publishing. But when people predict that print books will become a thing of the past, remember that being a thing of the past is the very thing that makes them invaluable. Do you have a story to share about how print books have influenced your life? I’d love to hear it. I want to be like Castle on tv. He is an amazingly successful fictional fiction writer who spends as much time finding ways to have fun as finding clever plot twists. But since we don’t live in tv world for more than an hour or two at a time, I struggle as a thriller writer to create a world that will both compel and terrify my readers. I’ve been obsessing lately with the danger of genre-bending, specifically wondering if a thriller toeing the edge of fantasy and science fiction is doomed for failure or destined for greatness. If you ever read my notes to myself, you might think I need a therapist, not a critique group (actual note: “I am having massive trouble with making this understandable and believable. Like the traps. The traps should already be in place. From the mysterious builder of the Dreamworlds. Why hasn’t anyone seen/visited the island, especially if it had castle, Parthenon?”). So on days like these, I take the Castle approach. Take time out for fun, like googling the “most handsome movie actors.” I’ve downloaded their photos to my writing software, but will not post them here for fear of being sued. As Braydon Fox, the rogue FBI agent who wants desperately to love my heroine, but she is terrified of loving him back – Leonardo DiCaprio, as he appeared in Blood Diamond. As Leonard Lathe, my heroine’s competing lover, a brilliant man whose growing obsession with the power to manipulate people’s thoughts is causing him to lose his own mind – Johnny Depp. As Damian James, the wealthy heir who only wants to be a good husband and dad, but feels he has to prove that he is worthy of his father’s money – Hugh Grant, wearing glasses. Have you made any casting decisions for your novel? 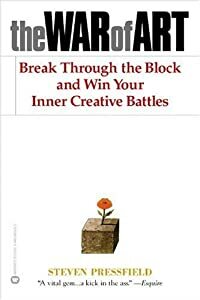 Several speakers at writers’ conferences recommended Steven Pressfield’s The War of Art before I broke through my resistance against touchy-feely self-help books and bought it. Pressfield talks a lot about Resistance, portraying it as a powerful entity that stops us from realizing our dreams. I had always blamed time, mainly lack of it. I was thankful that The War of Art was a compact book, broken up into short pieces that I could read while waiting to pick up my kids from band, etc. I soon realized it was much more than that. I’ll be sharing some of Pressfield’s ideas in future posts, but one that particularly caught my attention today was his one-page insight that Resistance is Most Powerful at the Finish Line. He used the story of Odysseus, so close to home after overcoming dreadful obstacles. His weary men could see the fires of their beloved families on the beach. Odysseus, thinking he was safe at last, lay down for a nap. His men tore open an ox-hide sack they thought contained gold and treasure. But the sack held the Winds, given to Odysseus by King Aeolus. The Winds blew Odysseus’s ship far away. Odysseus had to endure many more trials, losing all of his men, finally returning home years later. Pressfield cautions that since Resistance makes us afraid of success, the danger is greatest when the finish line is in sight. My goal is to e-publish my thriller in November. Even now, I can hear “Resistance” telling me that I’m stealing too much time away from my other obligations to write, that The Seventh Stone can’t possibly compete with so many other thrillers, that people who know me will think I’m delusional if I think I can tell a good story. I could go on, but that would give Resistance the power of the Winds. So don’t let Resistance stop you from pushing through to that finish line and crossing it. Or you will never know what waits on the other side. I posted this Listmania List on Amazon. I’d love to hear what YOU think and if you have any recommendations to add to this list. I’m always looking for thrillers for thinkers!